Instant Car Donation was founded with the goal of bringing donors and local charities together with an efficient and pleasant process. You can focus on deciding which of our respected charities is right for you instead of worrying about difficulties of researching how to make a donation. After your free pickup, we will assist you in recieving the best tax benefit possible for your generous gift. We take pride in helping smaller charities easily receive car donations, bringing people together while helping support those in the Goodyear, Arizona community who need it the most. Here are some of our favorite charities in the Goodyear area. We have made sure each of them are eligible for tax deductions when you help your local community by donating your car. Your values and choice can make a difference. Since it began in 1998, Arizona Christian School Tuition Organization (ACSTO) has awarded scholarships to more than 19,000 students attending 150 Arizona Christian schools. Over 50,000 visionary Arizona taxpayers have made this possible by donating to ACSTO, and taking advantage of Arizona's unique opportunity to receive a dollar-for-dollar credit against their Arizona state income tax. The goal of ACSTO is to further Christian education by effectively implementing the provisions of the Arizona private school tuition tax credit law for the benefit of Christian school students and their families. Protecting the Family, Preserving the Future. Center for Arizona Policy (CAP) promotes and defends the foundational values of life, marriage and family, and religious liberty. Our heart is to create an Arizona where: the sanctity of human life is protected from its very beginning to its natural end; marriages and families are strengthened and supported by public policy, not attacked or weakened; and religious liberty is affirmed and protected, free from government interference. Frontiers is an international organization, recruiting, sending and serving teams of ordinary people for long-term service to the communities of the Muslim world. Our members serve in businesses, community development, and other service capacities to help provide resources and knowledge through love and respect to those who are in need. We are actively recruiting new leaders and members to go to the Muslim world today, especially to those places where the love of Jesus is not yet known. Frontiers will also help prepare our members for service and actively engage them to succeed at the tasks they perform abroad. Since 2001, The Presidential Prayer Team has been the source millions of Americans have turned to for encouragement and inspiration to pray for America, our President, our national leaders and our Armed Forces. We are a national ministry dedicated to a focused mission of encouraging, inspiring and practicing prayer on behalf of our President, nation's leaders and our troops. We also seek to be a catalyst in the development of a robust prayer lifestyle. We do this by finding and providing tools to encourage prayer - through email, web, mobile phones and other communication tools. Ultimately, we believe that prayer will transform our nation, one heart at a time. There are lots of charities in your Goodyear, Arizona area which could benefit from your automobile donation. We not only assist you contribute to a nearby charity, but we concentrate on supplying small regional non-profits with an effortless method to accept donations they can concentrate on their work. The donation will make the difference for these charitable institutions, like The Presidential Prayer Team, bringing people together while helping encourage those within their neighborhood Goodyear community who need it the most. It's necessary to Instant Car Donation which you get the greatest tax deduction advantage without having carry out extensive research or to navigate complexities possible. We all of our engaging charities, like Center for Arizona Policy, to confirm your donation would be tax deductible. The procedure will be streamlined to both you and the charity of your choice. We'll help you after your finished donation. Car donations are the most accountable method for people to create a charitable donation. Because of this, one of their aims is to empower those making a benevolent decision by making sure that the car goes into the charity which reflects their values. When donating with us we always make charity decision an essential part of the process. In case you want us to pick that charity would be helped the most we can do this also. Besides the charitable tax deduction rather than getting the hassle of dealing with an old car, the sensation of being able to assist those in need might be the best reason to give your automobile to a charitable institution. An additional advantage of donating a secondhand car to charity would be your opportunity to just get rid of the vehicle without needing to attempt to repair or promote it. Most charitable automobile donation programs will except vehicles if they are operating or in need of repair. Some cars or trucks which are beyond repair will be sold for scrap or parts along with any money received will go to the charity. When you choose to make a donation of a old vehicle, such as a Saab 9-7,, when the charity sells the car, such as a Pontiac Montana/ SV6, for more than $500 they are required to mail you a receipt which lets you deduct the sales cost of the automobile, such as your Honda Ridgeline, on your tax return. If the older car you opted to donate isn't worth at least 500 bucks, then the IRS allows you to determine the fair market value. This is the value that somebody would be ready to buy the automobile if buying it from you. In order to claim the tax deduction, so you will have to itemize your deductions on your tax return. You claim the tax deduction, along with the charity either gets to utilize the car or sells it and uses the proceeds for the good of the charity. That's a win-win for everybody involved. Car donation programs are becoming popular in Arizona over the last ten years or so, as more charities are searching for new and innovative approaches to generate funds. Nowadays, the amount of charitable car donation programs numbers in the hundreds or even tens of thousands. When you have a favorite Goodyear charity you prefer to make contributions to, it's probably possible for this charity to receive at least a portion of the funds when you give your used automobile. Charitable vehicle donation programs permit you to give your used auto to the charity of your own choice. Visit our charities page to pick a charity in Arizona to contribute to. Most used automobile donation programs will either sell the vehicle to increase funds for your cause, use the automobile, such as your BYD Auto BYD e6B, in the daily operations of the company, or give the automobile, such as a GMC Cutaway Van, to a somebody who needs help either for free, or even for less than the fair market value. When there are many benefits to charities which receive donations from people, the advantages to the you, the donor might not be too clear. The largest advantage which most people hear is your opportunity for a tax benefit. There are a few limitations on this type of deduction, which means you could want to speak with a tax pro prior to making the donation. Is there a tax benefit for donating my vehicle in Arizona? We can guarantee your car belongs to some non-profit organization, such as Frontiers, that's qualified for tax deductible donations and help you recieve a reciept on the donation. You may have the ability to acquire a tax benefit for your auto 18, should you itemize your deductions. For contributions up to $500 you're able to utilize Kelley Blue Book and for bigger donations the non-profit organization, like Langham Partnership, must verify what they recieved to the automobile donation (more info). How can my car be delivered to the Goodyear charity? 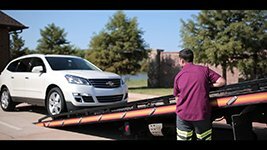 We will arrange a tow truck to come pick up your automobile and send it for you. It couldn't be much easier today, to assist the charity of your choice! We accept cars in all conditions! Go to the form and ask to contribute, and we will see what we can do. Would you help me find a Goodyear non-profit organization that fits my personal principals? We would like to assist you make sure your donation goes to a cause in Goodyear you care about by assisting you to pick a non-profit organization that fulfills your values. It is so important for us we do it every single time you give with us! What charities do you help in Goodyear? Instant Car Donation proudly supports respected national & local Goodyear nonprofit organizations in your area. We work hard for you to be sure maximum support is recieved by the organizaion for your car or truck. All owners on the car title must complete the section of this car title labeled "assignment of title by owner" or "transfer of ownership by seller". Most states require signing and printing owner names. You should fill out any areas that need information about a buyer/purchaser/transferee with info. Instructions may be found by you here. First we'll speak to the charity, like Center for Arizona Policy, of your choice (or select one for you if you asked that instead) to make certain they need your own automobile, like your Jeep CJ-8 Scrambler, which takes around one business day. We'll arrange to get a tow truck to come for you for pickup. When it's taking a bit more time feel free to give us a call. When you give a vehicle, like a Subaru GL-10, then you can contribute from the center. There are several deserving charities out there that are in need of your aid, especially in Goodyear. This a excellent illustration of a charity which touches the lives of numerous in the neighborhood community. We can not all do the important job that Benevilla does, but we can all lend a hand to empower and further its mission. Do you have a vehicle in need of a new home? Before you click on the donate button, then take some time to check through the many pages of charities, like The Urban Ministry Center, which we partner with. Which of these talk to your heart? Then have a minute to reflect. What wishes do you need for your people of your area? After that, imagine how by carrying an action as little as donating your car in Goodyear, you're in a position to help make one of those fantasies come true. Imagine what chain of events that your car donation could set off in Goodyear and beyond. Do the fantasies that you have go beyond the pages of our site? Probably. We must all dream large, especially when it has to do with the great wishes and joy which we earn for others. But some us might realize that the charity we wish to contribute our automobile to isn't listed on this website. We can assist! You can still click the donate button and let us know that there is a respectable charity, such as Marine Conservation Institute, out there which that is not listed on our site. We'll contact that charity and use our resources to be sure it can receive your donation. The practice is simple. When you click on the donate button and then let us know you're ready to donate your car, such as a Buick Coachbuilder. We'll organize a free pickup for your car in Goodyear or your neighborhood region, and list at auction to get the maximum price possible so that we could produce the maximum donation possible to the charity of your own choice, including Frontiers. Not only will you get to give your car from the heart, but you're also qualified for a tax-deduction. We'll finish your tax receipt and also offer the non-profit with desired IRS paperwork in addition to your own donation. Giving in the heart could not be simpler! Have you thought about donating your vehicle to your charity? It may well not be as simple as you believe. Many charities, such as Sojourner Center in Goodyear, Arizona aren't equipped to take care of car donations, since it takes one to hire staff to simply take in the vehicle, assess it, sell it, then do most of the paper work and accounting. By this time this process is finished, the actual monetary donation to the non profit might be quite small after paying to get all the overhead. Why don't we in instantcardonation.com help. We make it very easy for practically any nearby charity, such as for example Frontiers at Goodyear, Arizona to have their very own car donation program because we expel most of the hassle. When a nonprofit, such as Sojourner Center at Goodyear, Arizona partners with immediate Car Donation, they be given a full sized automobile donation program. We take care of everything and are able to simply give the charity a donation checked with each the necessary paperwork completed from the ingestion and sale of each vehicle. Our process is straightforward. We'll take any vehicle, such as for example Electric Mobile Cars Electric Mobile Cars. First fill out an intake form. Then, we'll contact you to verify your automobile donation. Next, we will send a tow truck to pick up your car within 48 hours. From there, we treat every thing. We'll fix the car and sell it to your most value, in order for your donation will be maximized, or whether it's truly isn't worth mending up we'll sell it is. It's a win-win situation. The headache of having their very own automobile donation program isn't always worth it to get local charities, however when individuals be careful of most the heavy lifting, it is a excellent source of design to get non profits. We help can help local charities like Arizona Christian School Tuition Organization in Goodyear, Arizona and larger charities such as Caring for Cambodia. For instance, your donation will help Feed My Hungry Children in Goodyear, Arizona to further their own mission. This kind of fundraising service makes it possible for charities such as Society of St. Vincent de Paul - Phoenix in Goodyear, Arizona to focus on their time and energy on exactly what they are best at: helping the others. For those who have a neighborhood charity, like Center for Arizona Policy at Goodyear, Arizona you'd like to help and also have an automobile, like a Geo Storm to contribute, then simply fill out and ingestion today and we'll be sure you are able to make the most out of your donation. Moreover, in the event you do not see your favourite charity on our website, then feel free to send our website information into your charity and also request that they join our program. Alternatively, you may reach us out at info@instantcardonation.org and we'll get in touch with your charity of choice to find out whether they'd like to have their own vehicle donation program that is fully handled by people. Spread the word and make your beloved local non-profit, Frontiers in Goodyear, Arizona prefer to maximize their fundraising and reach their own goals with their own vehicle donation system!